She is a phenomenon: Sophie Fontanel, 55 years old, is one of France's most important fashion influencers. Despite her age, despite her gray hair, the long-standing Elle editor, who rose up to become the magazine's fashion director, started an Instagram career only a few years ago and now has over 129,000 followers. The equally funny and eloquent journalist and author is now a sought-after social media expert because she understands the mechanics of the fashion industry as well as the tricks of the social media scene. 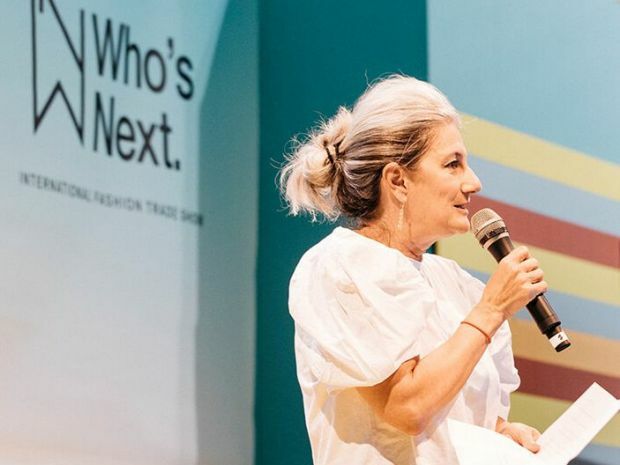 The Parisian fashion trade show Who's Next gave Sophie a "carte blanche" to provide a few social media tips to today's fashion crowd. The store's space and equipment are important, but that isn't the only thing that matters. At the moment, fewer and fewer people are walking into stores. You have to ask yourself why? What makes people want to go into a shop? What is the role of the window displays? Every time I see a shop window, I wonder why people don't treat it like the title page of a magazine. You can tell what's great about your shop from the window. You have to create your own language, with pictures shot with the smartphone, for example. A single, funny picture can persuade a costumer to come into the store and buy something. A shop window doesn't have to have a glass pane; Instagram can also be a shop window. Or Facebook, Pinterest etc. Everyone has an account nowadays. What makes sense on Instagram? And who can create content? I always notice that people have inhibitions selling themselves. They don't really say what they do through the social channels. On Instagram, it's not enough to just say "We're opening a pop-up store." No, you have to add some engaging pictures and sell this news properly. You have to get rid of your complexes and remain natural. That way everybody can fill the internet with real content. It isn't enough to simply send a product to an influencer. If they aren't interested, they'll resell it right away. Some people think that because they send something to an influencer, they'll wear it every day. No, it doesn't work. Better to let the influencer decide what they want to try. I know, it's difficult. But it's difficult for everybody. Even the big brands haven't yet understood how to reach customers emotionally via social media. For this reason, a famous brand is sending me to Japan next month, so that I can manage their Instagram for them, because they can't do it themselves. The influencers you need are not easy to identify. Someone who has 250,000 followers may want to be paid 15,000 euros for three posts. A small brand or store cannot pay this. But such people aren't real influencers in my opinion. An influencer, for me, is someone who interacts constantly with their followers. The emotional exchange comes when the influencer shows what they really like. The secret to my success is, of course, that I'm constantly showing myself off on Instagram. Is that egocentric? Yes, it may be. But I also reply to almost every comment from my followers; I interact. I've never bought fans and I buy all my clothes myself. I've even set up a company so I can get a tax deduction for the clothes I buy. Meanwhile, I also do consultancy for companies, but I don't always get money for it. Some things are paid, others are not. That's the way it is. There must be some equilibrium.